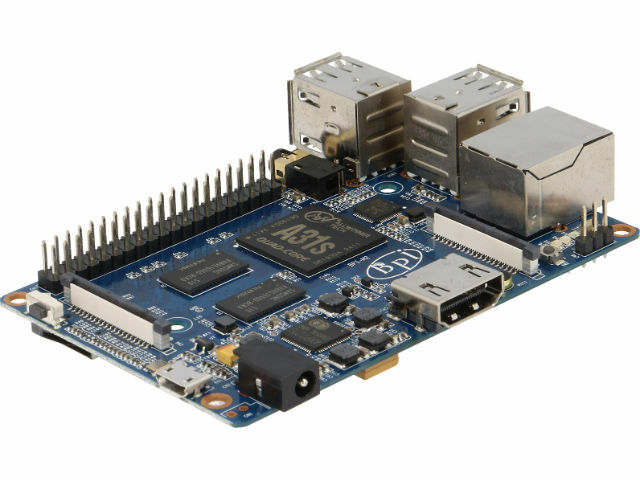 The BANANA-PI-M2 computer is based on the ARM Cortex A7 Quad-Core processor clocked at 1 GHz. The processor features an integrated GPU, which displays picture in Full HD resolution. The computer features 1 GB DDR3 SDRAM memory. It can operate under Android, Debian Linux, Ubuntu Linux, or Raspbian booted from a microSD card. The computer offers e.g. an embedded Wi-Fi module (802.11 b/g/n), Gigabit Ethernet port, microSD slot, 4 USB A 2.0 ports, a USB OTG port, and HDMI and AUDIO OUT ports (3.5 mm jack). Additionally, the computer features an infrared receiver, and the CSI connector for connecting a video camera, as well as a display (LVDS/RGB Display Interface). The manufacturer also thought of more advanced users, equipping the computer with a 40-pin GPIO connector compatible with the Raspberry Pi model B+. The computer must be connected to a 5 V DC power source with current output of at least 2 A. Users of BANANA-PI-M2 can also choose from a series of accessories, including a camera, 7” LCD display with a touch panel, memory cards, and connection cables.